Between shows, Valerie's desk is clean for a few minutes anyway! 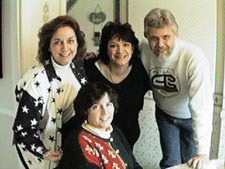 Bright Star Promotions, Inc. was incorporated On October 11, 1982 after producing shows three years before this date. Valerie Rogers, the President is passionate about her associating with creative, talented artists and the eager collectors which she introduces to each other at the teddy bear shows.Traveling many miles a year, organizing the shows in the hotel's ballrooms, she still finds time to be the editor of the popular online teddy bear magazine called; Bears&Buds. In her spare time she loves to entertain her family, play with her grand daughters, make a few crafts or decorations for her home which she shares with two cats. Extra help in the office. Rachel handles the computer data entry. Will the books ever balance? 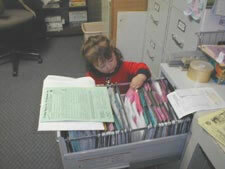 Kinsey - Our new file clerk! Wonder where those application forms are? Valerie, wearing stars naturally, Dawn Emerson (Vendor Service Manager) and Ben Ewing. 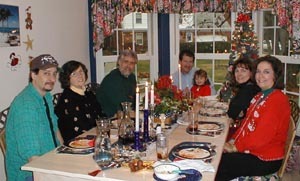 Seated is Mary Claypool. 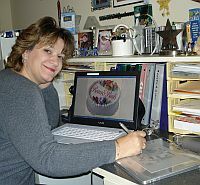 Dawn is also our graphic artists who creates the monthly covers and banner for Bears&Buds Webzine. Online monthly teddy bear magazine. eMail: Bright Star Promotions, Inc. Copyright © 1997 - 2009 Bright Star Promotions, Inc. All rights reserved.